This week I'm covering a slightly different topic from the usual reviews posted here. If you're a consumer of music, it's easy to overlook the work that goes on behind the scenes but for anyone starting out as a songwriter, performer or live music promoter the whole area of royalties can be confusing. Rebellious Jukebox spoke to Andy Ellis of PRS for Music about the work of his organisation in supporting new music, and what songwriters and venues should do to ensure that everyone is paid fairly when their music is used. Let's start with the basics: Who are PRS for Music and what do they do? PRS for Music is the umbrella title for PRS and MCPS, both of whom issue licences and collect royalties on behalf of their members; songwriters, composers and music publishers. What's your role in the organisation? I lead the Education & Outreach Team. We help music creators, music industry and music consumers to understand what PRSfM does, how, why and for whom. What do performers and songwriters need to do to ensure they get what they are entitled to? Well, performers need to register with a separate organisation - PPL. They pay out to anyone who makes an audible contribution to a recording that is then broadcast (for example). Songwriters (and composers) would need to join PRS if their music is getting 'publically performed'. This could be getting played frequently on the radio or if they are playing lots of live shows or having their music streamed a considerable amount of times. The reason it's best to wait until there is a reasonable amount of activity happening is because there is an admin fee to join PRS and MCPS so there is little point in spending that money - £50 for a lifetime membership - unless you are likely to be receiving around that amount in royalties or more! PRS is a not-for-profit organisation and is owned by its members so we really do want members to join at the best time for them. What do promoters and venues need to do in terms of registering and on an ongoing basis when events take place? Quite simply, promoters or venues need to have a PRS licence in place in order to 'use' PRS music. Does an artist need to do anything after they've performed a gig or is it the venue's responsibility? It depends on the type of venue but I generally advise all performers who play live to submit a set list to PRS via our website. Better that we get it twice - once from the promoter and once from the performer - than not at all. If we don't know you've played, we can't pay out for those performances. Is this actually a legal requirement and what are the consequences for the venue if they don't, for example, submit the details of a live set? It is a condition of the licence terms but we would always rather encourage venues to submit set lists. There's no reason not to really, and it helps the performers who are playing that venue get their royalties for those shows. If a venue has a DJ playing recorded music rather than a live act, or a DJ playing between the bands, should the songwriters still receive royalties for those songs that are played and what should the venue do in this case? Yes, those songwriters would still be entitled to a royalty for those uses of their music. We encourage DJ's to submit set lists so that we can accurately pay out against the music they are playing. This is perhaps of particular interest to genre specialist DJ's; by submitting a set list they are able to further support their own scene by helping us to pay out accurately to those music creators. And they - the DJ - may well be one of those music creators too, so they can get a PRS royalty from playing their own tracks! What about streaming services such as YouTube, Spotify etc. 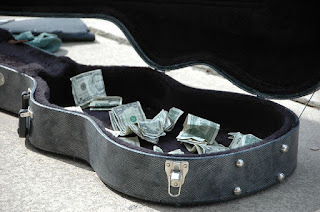 - do artists receive royalties when someone listens to a song on one of those sites? We do pay out royalties to songwriters and composers when their music is streamed, yes. Sites such as Spotify and YouTube are licensed by PRS. What do PRS for Music do to support new performers and venues? PRS funds the PRS Foundation, which is the biggest supporter of new music in the UK. The Foundation supports artists, performers, promoters, composers, bands, ensembles etc. though various schemes to encourage and develop the growth (and even export) of new UK music. We also support the PRS Members Benevolent Fund which supports composers and songwriters in times of hardship, perhaps when they are ill and unable to perform live for example. Are you aware of any initiatives in Birmingham in particular (where this blog and many of its readers are based) to encourage new live music? Most of the musicians I deal with simply enjoy the creative aspect and have no intention of giving up their day jobs. Do you think there is still a healthy percentage with this attitude compared with those who just want quick fame and fortune in the light of TV talent shows? The vast, overwhelming majority of musicians I know or work with fall into this camp. They just love creating and performing music. If that can lead to a career, even a part-time one then great, but for most they are just happy to be involved with music. Finally, do you have any advice for someone starting out as a performer or opening a live venue? Leaving aside the obvious (join PRS at the right time/get a licence from the beginning) I would say that one thing both have in common is the need to focus on the audience. Build that relationship well, and both career and venue will benefit.